Caroline Julian might be one of the most under-used extra characters on Bones. She's boisterous, witty and always on point. There are at least three squints I would gladly trade to have more of her in my life. Fisher, Daisy, and probably Finn, in case you were wondering. Even with her googly eyes and suggestive comments to the goofy filmmaker, which I found to be more than slightly silly, I still love her. Can we start a campaign to keep her around? Aside from just about every aspect of the "let's make a documentary" angle of tonight's episode, "The Blood From the Stones" wasn't terrible. Maybe this means I've finally resigned myself to the stand-alone format the series has adopted on Bones Season 8. It allowed Booth to be Booth. Booth started the case willing to give the deceased the benefit of the doubt, but as the evidence began to pile up against him, Booth could no longer defend the man as good, despite the reassurances from the commanding officer that the deceased hadn't been a bad cop. Where the evidence leads, Booth goes. As it happened, the evidence led him to the victim's wife, the woman for whom he had planned to smuggle the diamonds. Booth is a moral guy. Cops are good guys. Bad guys are, well, bad guys. And because he's so moral when it comes to good and bad, bad cops are among the worst offenders in the land. In his mind one bad cop spoils the bunch. They all become untrustworthy and their reputations are all sullied when a good cop goes bad. Even if the good cop goes bad for love. I like Booth and I liked seeing him work tonight's case more than I've liked watching him work many of the cases this season. He wasn't campy or cheesy. He didn't have to play a silly role or go into the lab like a squint. Booth got to be an agent and do his job well. Similarly, what also worked was that Brennan had a moment of clarity regarding her personality, and it wasn't an easy revelation to have. The board of directors brought Clark in to temper Brennan's harsh and critical nature for their documentary, which forced her to introspection and the realization that she comes across as cold and unfeeling. Mean, even. This particular revelation reminded me of the episode where she was testifying in court and she was told they would lose the case because of her lack of emotional connection to her testimony. There are times when Brennan looks inward and sees herself as others see her and from there she grows as a character. Tonight was one of them and it was a good moment for Brennan. 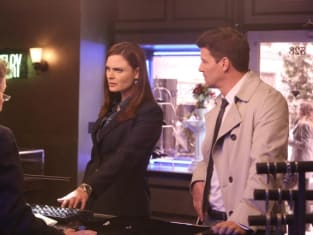 Another good moment, one that I thoroughly enjoyed despite its being used as the promo for this episode, was watching Booth and Brennan at the diamond dealer's store. Dancing around the question of what they are to one another was fun and a bit sly. Booth is more than her boyfriend, but not her fiance'. Brennan doesn't believe in the institution of marriage but struggles to define their relationship. There was something glimmering in Booth's face during that exchange. He knows that he's right about the two of them. That one day, she'll propose and he'll have been right all along. Booth is already there and would've married her long ago. He's just waiting for Brennan's head to catch up to her heart. What did you think of "The Blood in the Stones"? Which squint would you trade for Caroline, if any? Do you think Booth and Brennan will head to the altar before Bones ends? Jursick: Now THAT was genius. Bones: I am actually a genius. Permalink: Now THAT was genius. I am actually a genius. Angela: You really are one of them, you know that? Angela: The big brains who belong here. You just hide it. And you dress a lot better. 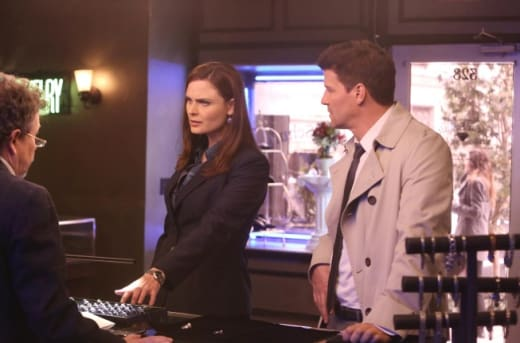 Bones Episode Promo: Are You Proposing?